Bakit umiyak si Anne Curtis sa kanyang concert sa Canada? Anne Curtis shared an emotional moment she had during her concert in Winnipeg, Canada. 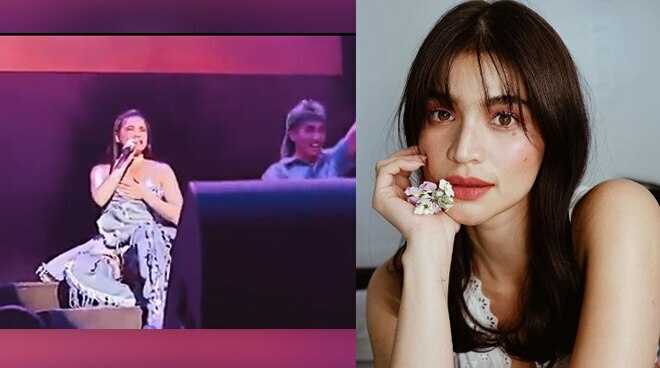 Anne Curtis shared an emotional moment she had during her concert in Winnipeg, Canada on social media. The actress-performer posted a clip where she teared up while performing on stage. She wrote, "One out of my favourite moments from my tour. Like a sky filled with pretty stars. Couldn’t help but get emotional... when you’re touring it’s sooooooo much fun but it can take a toll and you get tired from all the traveling but the moment you get on stage and see all the smiles, the energy switches right back on and you feed from the love of your audience that's what keeps you going." Anne expressed her gratitude to her fans for supporting her. "Thank you for this kind of love madlang Winnipeg. Won’t forget this AND the standing ovation! Wait lang hanap ako video! Hahahaha! Love you so much!," she said. The It's Showtime host was in Canada for a series of concerts for her "AnneKulit” concert tour.